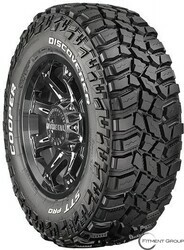 Using the most innovative technology available, Cooper has developed the ultimate tire- the Discoverer STT Pro. This is Cooper’s most current ultra-high performance mud- terrain tire. The Discoverer SST Pro is an off-road tire designed to deliver supreme performance while driving off-road or on the highway. Drivers are guaranteed exceptional traction, superb handling and steering response, sturdiness, and durability. The Discoverer SST Pro features a distinctive tread pattern that provides enhanced grip and traction even in the most severe conditions. Features of the Discoverer SST Pro includes •	ARMOR-TEK3 CARCASS PROTECTION: Cooper's exclusive and proven complete 3-ply carcass construction in the sidewall and tread offers 50% more safeguard from damage by impact than regular 2-ply tires. Carcass protection is maximized by the third ply that is slanted at an optimum angle to the first two plies to deliver better performance in severe off-road conditions. •	3-2 INNER TREAD RIBS: The Discoverer STT Pro internal tread ribs are placed in an irregular 3-2 pattern. It has a distinctive hybrid pattern that provides several substantial performance benefits such as enhanced stability and handling, reduced road noise, better soft surface (path) and mud traction, uniform wear, and less inclination for drifting of the vehicle, which is a regular occurrence on fitments with forceful off-road tires. •	LARGE DEPTH SIDE BITERS: Large, specially designed rubber cleats (side biters) are placed on the sidewall shoulder to deliver improved traction in muddy or soft terrains, and rocky conditions where extreme grip is crucial. The design and position of these cleats boost traction on inclines and decrease any possibility of tire sideslip. •	FLEX GROOVE: This is a small, circumferential groove in the support area, which creates an intentional flex point in the tire. The ability to flex in a fixed location produces a smoother ride when traveling on uneven and tough terrains. •	ALTERNATING MUD SCOOP & ASYMMETRICAL SCALLOP: Asymmetrical scallops on alternating lugs channel mud into the mud scoops allowing the Discoverer STT PRO to navigate muddy terrains easily. The "scoops" act as shovels by digging consistently into the tire as it rotates, allowing the Discoverer STT PRO to dig in and confidently pull the vehicle through any tough situation.